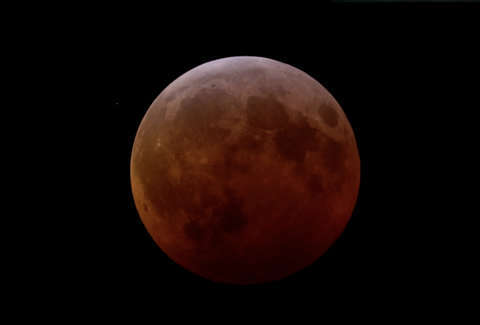 Asinine name aside, the total lunar eclipse on January 21 (referred to by many as the Super Blood Wolf Moon) was a spectacular experience. It was a total lunar eclipse on the same night as a supermoon, which is a lot of things to be going on at once. It turns out there was even more taking place than you might have noticed. In the midst of totality, eagle-eyed observers spotted a meteoroid flying directly into the copper-colored moon. The tiny spec of light impacted the moon, and the scene was captured by many telescopes. Among the observatories that shared a great view of the collision was the Griffith Observatory in Los Angeles, which streamed the entire eclipse on YouTube. The impact was confirmed by the MIDAS Survey, which monitors these kinds of events on the moon. However, even zoomed-in, the meteoroid looks like a star, just a pinprick of light in the darkness. It would have been awfully difficult, if not impossible, to spot the meteoroid strike from Earth with the naked eye. Nonetheless, it adds a fun layer to the eclipse, especially since there were so many live streams of the event, providing the opportunity to turn back and see the impact replayed.